100% Natural Un-Bleached USA Cotton Batting. Carded & needle punched to prevent bunching and shifting. Great for hand or machine quilting. Can be quilted up to 4" apart. Washable. 3-5% Shrinkage. Crib size: 45"x60". Sold individually. Not available drop shipped. 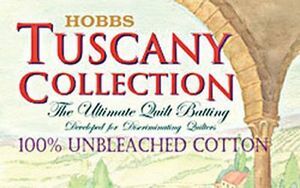 The Tuscany line from HOBBS is only distributed through independent retailers.